The last post marked the halfway point of the #craicinatlantis roadtrip. For bearing with me here and following along on the new path, you guys deserve a treat. 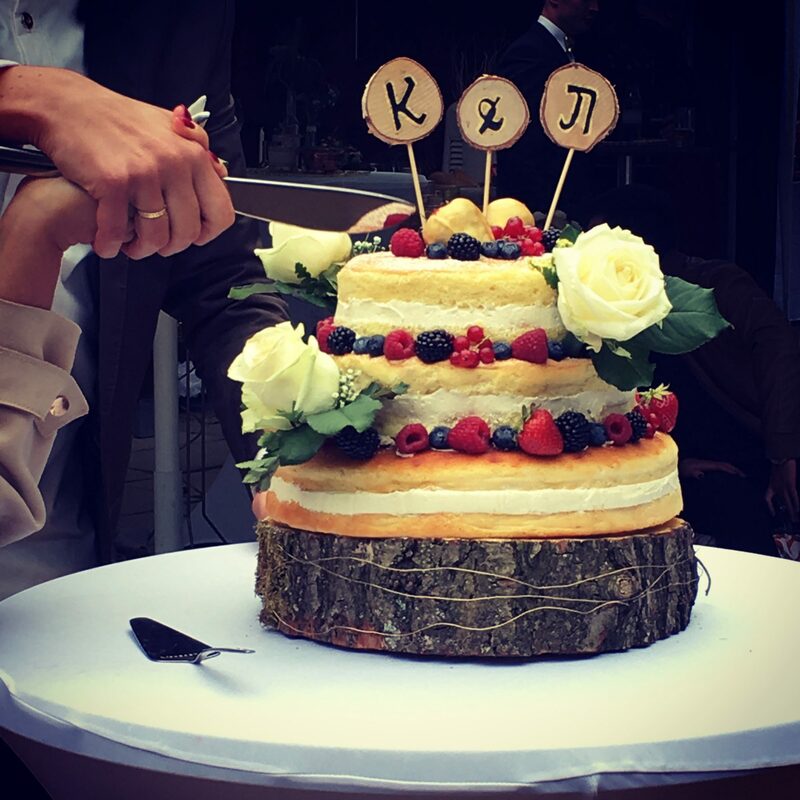 Those of you who followed my Instagram might have noticed that I was a bit in alert mode lately as I agreed to make the wedding cake for my former Handball teammate and her husband. She asked me earlier this year and as her request seemed to be doable (no fondant fuzz, a pretty naked cake with seasonal berries), I said yes. Can you believe it, Christmas is only 1 week away. Nothing says „I care about you“ better that a homemade gift. It shows that you rather invest some of your precious time to delight your beloved ones than just ordering a gift online. There is nothing wrong with buying gifts, don’t get me wrong, but I love to give a little personal touch with something crafted or homemade and you should consider that too. So get into the kitchen or at your craft table and whip, glue or paint something for the ones that you love! I know I promised my German readers to start blogging in German. I know some of you hav been waiting for this for a long time, but still I am trying to tackle some technical obstacles. 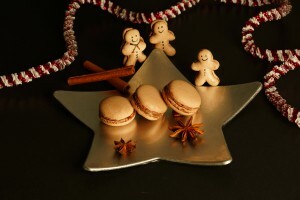 But today is your lucky day as this Christmas Macaron recipe is part of the Advent calendar over at Kuchenbäcker blog. I am really excited about this and I hope you enjoy the read and of course the making of these wonderful Christmas treats. I put them in selfmade matchbox-like boxes or painted egg boxes, nicely decorated and with colourful ribbons. If you want to gift them for Christmas, here is a useful bit of information: They keep fresh in the fridge for up to 3 days or you can freeze them in ziplock bags. If you have never done Macarons before, you might want to look into my basic macaron recipe for some general tipps. Mix sugar and lemon zest and let the zest infuse the sugar for at least 30 minutes. Meanwhile you can weigh the other ingredients and do your preperations for the Macaron shells. Place the heatproof bowl over simmering water, the bowl shouldn’t touch the water. In order to make the curd creamy you should not work in too much air, that’s why using a rubber spatula instead of a whisk is advised. Mix egg yolks, eggs, lemon juice and lemon infused sugar with the spatula in your bowl. Place the butter in another bowl that the siev fits onto. Keep the mixture in your heatproof bowl in motion so it doesn’t burn on the sides. The mixture must reach a temperature of 85°C. Once the temperature is reached, pour the mixture into the siev over the butter-bowl. This helps to get rid of the egg crumbles and results in a smooth and silky curd. Use the immersion blender to work in the butter, hold it upright to prevent too much air and keep blending until the mixture turns whiter. Cover and refrigerate while making the Macaron shells. Cut 4 sheets of parchment paper to fit your tray. With pencil and 2€ coin draw circles on your parchment and leave some space in between. You need an even number as each Macaon is a sandwich of 2 shells. The lines should be thick enough that you can see them through the parchment when you turn it upside down on your tray. Preheat the oven to 170° C with fan. Place ground almonds, confectioners sugar, gingerbread spice and cocoa in the food preocessor and process in pulse mode. The resulting mixture is called Tant-pour-Tant. Sift the mixture into a bowl to prevent crumbs and set aside. If you do not own a stand mixer, you will need a helping hand for the next steps. Put 75 g egg white in a heatproof bowl that fits in your stand mixer. Place water and sugar in the sauce pan and cook to syrup over medium heat. Use the candy thermometer to check the temperature, it must reach 118°C. As soon as 114° are reached, you can start the stand mixer or your helper to beat the egg whites until stiff at medium speed. As tempting as it may seem don’t put on highspeed as it will result in a heavy foam but we want silky smooth foam. Once the sugar syrup has reached the temperature you can remove it from the heat and let it sit until the bubbles disappear. Slowly pour the syrup into the stiff egg whites while constantly beating at medium speed, once all syrup is in there, you can put the mixer to high speed and beat until the meringue is lukewarm. While the meringue is beaten, you may mix the second 75 g of egg white with the Tant-pour-Tant with a rubber spatula until completly blend. Once the meringue is cooled, you should add a little red food colouring to intensify the brown colour of your Macarons. 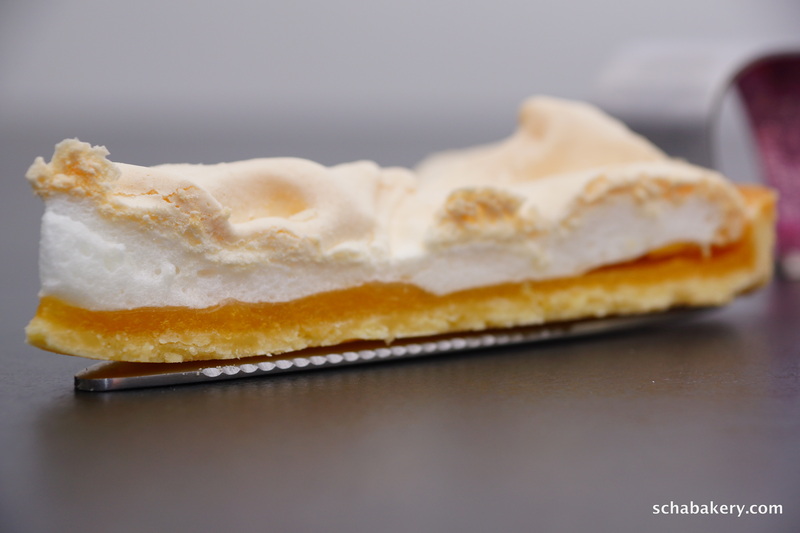 The meringue should be light rosé before you add a bit of it to your Tant-pour-Tant to blend. Then fold in the rest of the Meringue -et voilá your Macaron mass is ready to go. Transfer to a piping bag with round tip and fill the circles on your parchment paper as exact as possible without causing noses and bumps on the surface of your Macaron. Use your flat hand to slighty beat the bottom of your tray in order to get air bubbles out of the Macarons. Place the tray in the oven and set a timer for 6 minutes. If you look into the oven you can see your Macarons rise and get those typical little feet while the surface gets a lifting. When your timer buzzes it is time to turn the tray by 180° and give them another 6 minutes in the oven. Once they are done directly pull the parchment from the tray and let the shells cool. Please don’t let them remain on the hot tray as they will become too dry. Repeat the procedure until your piping bag is empty and all shells have been baked. Now it is time to sort your shells and be a matchmaker. Find a sizeable match for each shell and carefully push your thumb on the inside without breaking it. Fill a piping bag with the lemon curd and bring a dot on one half of your Macaron-couple. Sandwich them together and push slighty to spread the curd evenly between the two shells. Store them in a cookie tin in the fridge and separte each layer with parchment paper. Give them a night to develop their full flavour and enjoy with a spicy hot chocolate or a glass of mulled wine. The Macarons can be kept in the fridge for up to 3 days or can be frozen. If you have leftover curd, you can transfer it into a sterilized jar and keep it in the fridge for 1 week. Enjoy as spread or as a sour ice cream topping. If you need the Macarons to last longer, you can also fill them with a dark chocolate ganache instead of curd. 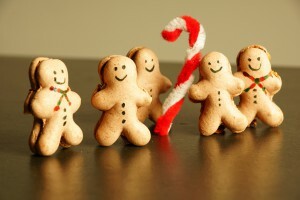 And aren’t these little gingerbread ma(n)carons adorable? Confessions of a baking addict: I am am obsessed with bakeware. I have tons of baking tins in all kinds of shapes but keep using only a fraction of them. But how many do you need? Many books suggest to aquire a loaf tin, a 8″ round one, a 9″ square pan and a bakingt tray. In addition some also suggest a 8″ tarte tin with removable base. For driving me home I granted one of my colleagues the choice of the July recipe from my To Bake List (TBL). As it was very hot that time he chose the lemon meringue pie. I was very curious to try it and compare it to the Tarte au Citron. You see I am still very proud of that Tarte stuff and I think I can be. That is why I always compare… But this pie was very tasty, too and definitely wins the time-benefit-assessment. As you might have read before I took a Patisserie class a month ago and I’ve been dying to do the recipes on my own. 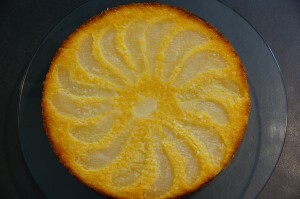 I was just curious to find out if I am capable of making a competitive Tarte au Citron all by myself. And yes, I CAN!